Capsicum (commonly known as peppers) is a genus of flowering plants in the nightshade family Solanaceae. Its species are native to the Americas, where they have been cultivated for thousands of years. In modern times, it is cultivated worldwide, and has become a key element in many regional cuisines. In addition to use as spices and food vegetables, Capsicum species have also found use in medicines. The fruit of Capsicum plants have a variety of names depending on place and type. The piquant (spicy) varieties are commonly called chili peppers, or simply “chilies”. 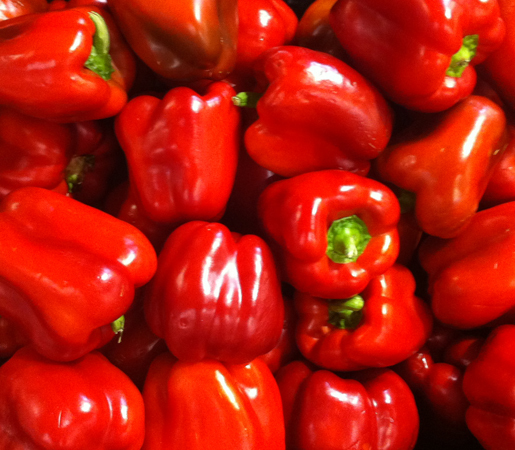 The large, mild form is called red pepper, green pepper, or bell pepper in North America and typically just “capsicum” in New Zealand, Australia, and India. The fruit is called paprika in some other countries (although paprika can also refer to the powdered spice made from various capsicum fruit). The generic name is derived from the Greek word κάπτω (kapto), meaning “to bite” or “to swallow”. The name “pepper” came into use because of their similar flavour to the condiment black pepper, Piper nigrum, although there is no botanical relationship with this plant, or with the Sichuan pepper. The original term, chilli (now chile in Mexico) came from the Nahuatl word chilli or xilli, referring to a larger Capsicum variety cultivated at least since 3000 BC, as evidenced by remains found in pottery from Puebla and Oaxaca.